I could get used to this "winter" weather. Great look girl! I can totally see Alexa Chung wearing this cool look, loved the layering! I love this outfit! I'm kicking myself for still not owning a vest like yours. I love it combined with the feminine accessories. love the army vest, and adorable shoes!! dying (completely, literally) over that phillip lim number. oh geez! Oh I could get used to this weather too!! Why couldn't NYC winters be 50 degrees and up??? I'm actually dreading the cold. Love the necklace of course and those shoes! 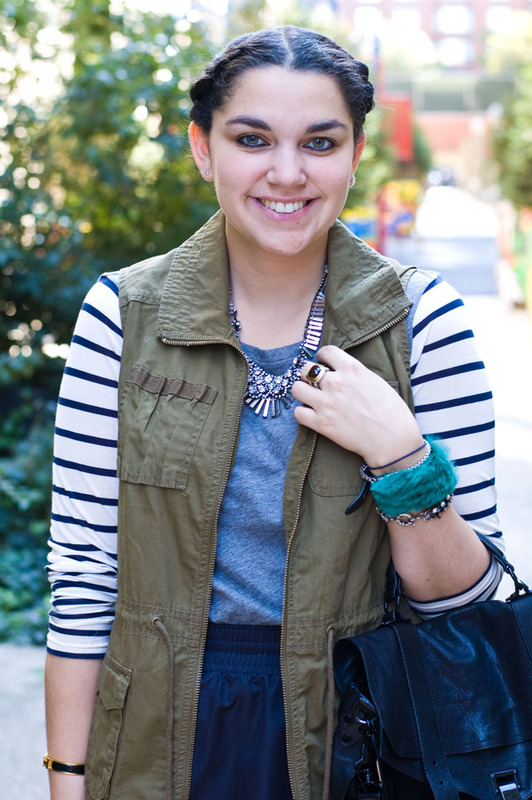 Navy stripes + military green + a statement necklace is one of my absolute, most favorite-ist combinations, and you executed it here PERFECTLY. PS -- I love the smiling photos, lady. Keep'em coming! I want my holidays cold!! I'm not a fan of cold weather beyond the holidays, but something about it being kinda warm right now is ruining Christmas!!! Love your vest and necklace! Perfect combo of casual and glitzy. Love this look!!! It is perfect for fall! 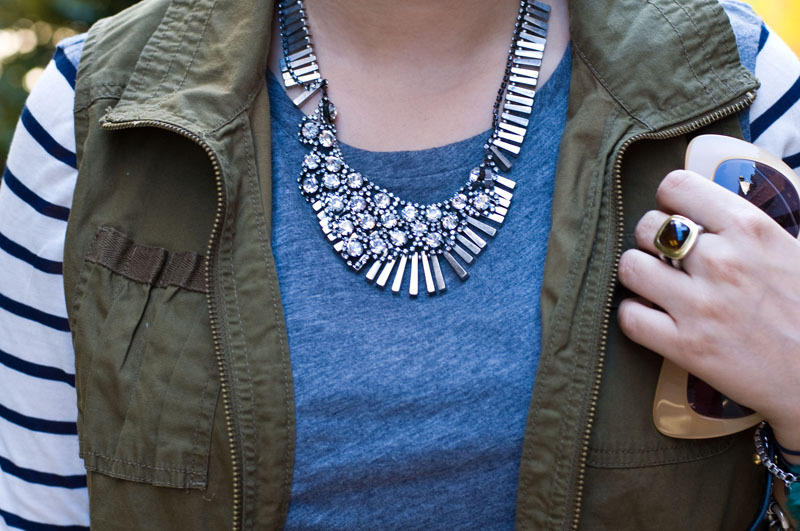 Great layering, and love the necklace! Love this look. I can really barely stand camo/army influences when it's taken too literally but I love how you've really made it work and look so elegant with the layering and preppy touches.